Rehovot is in tears as residents suffer the loss of a respected father and all five of his children in a fire of unknown origin. Rehovot is in tears as its residents unsuccessfully struggle to comprehend the loss of a respected father and all five of his children in a fire of unknown origin. The entire family now is lifeless, except for the mourning wife and mother. Funerals will be held Tuesday afternoon for Guy Shaer, 38, and his five children – Eliav, 11, Evyatar, 8, Amitai, 7, Shira, 3, and one-year-old Itamar. Fire and rescue officials are trying to put together the puzzle of the picture of tragedy, which began slightly before 10 p.m. Monday night. Guy and his wife Avivit, a teacher at a local girls' religious high school, were visiting the children’s grandmother nearby when Avivit noticed smoke pouring out of her house. 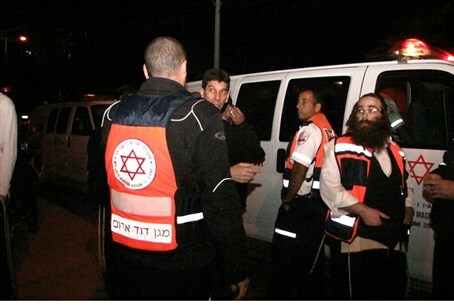 She frantically screamed that her house was on fire, and Magen David Adom rescue service received a call that a blaze was raging in a private home. It immediately sent a mobile intensive care unit, seven ambulances and three motorcycles. By that time, Guy had rushed back home and entered the inferno in an attempt to save his children, but the flames and smoke overcame him and killed everyone inside the building. All of them had died from suffocation and burns by the time medics reached their bodies. The tears from Avivit, family members and neighbors outside the house could have extinguished the fire, and several relatives fainted. Medics had to treat them for shock.